Ettore Sottsass, like many Italian designers, was originally trained as an architect before going on to a long career in multi-disciplinary design. That background may help explain the architectural look of the Praxis 48 typewriter that Sottsass designed for Olivetti. Unlike the personal, portable, and manual Valentine for which he is more famous, the Praxis 48 is large, heavy, electrically-powered, and intended for day-in, day-out office use. But despite its size, weight and angularity, the Praxis 48 is a masterful example of creating visual tension and contrast. Let's begin from the side. It's this side view that first struck me when I saw a picture of the Praxis 48 years ago. A wonderfully proportioned block presents up the keyboard cantilevered out the front in a dramatic gesture. And it's not cantilevered just by a little bit. The floating keyboard is a full third of the depth of the machine. There's a tension between the suspended keyboard (onto which you are pounding with your fingers) and the visually and actually heavy main block. Technical innovation by Olivetti's engineers led to a more compact keyboard mechanism. Another innovation allowed the carriage to be set lower into the main box for a sleeker look. Continuing the architectural theme, the side panels are corrugated on a fine pitch. This adds depth of texture to the otherwise flat, planar surfaces. There was also a manufacturing reason - the corrugations hid the fine off-color lines that can appear in injection-molded parts. Turning to the front we find another creative texture: the tops of the keycaps. The key bases are the same color as the surrounding body and extrude out of the slanted cantilevered surface. As a result, their dark green tips appear to almost float above the surface, like the keyboard itself floats above the desk. These keys are a prototypical version of the "volcano" shape that we later see repeated in purer form on the Divisumma 18 by Mario Bellini. Like most electrics, when the typewriter is off the keys barely move when pressed. Once the machine is activated, they depress and click contentedly as the arms strike the paper. The key caps' dark green repeats on a few other touchpoints - the ends of the platen knobs, and two buttons on top for releasing the platen from side to side. The repeating color spots draw your eye around the product - again like a piece of architecture it rewards looking at it from 360 degrees. Continuing around to the back, when the platen is centered the silhouette is of a T-shape, like the bridge of a freight ship. Like many typewriters the Praxis 48's platen moves from side to side as typing a line progresses, but the visual effect is particularly striking with the 48. 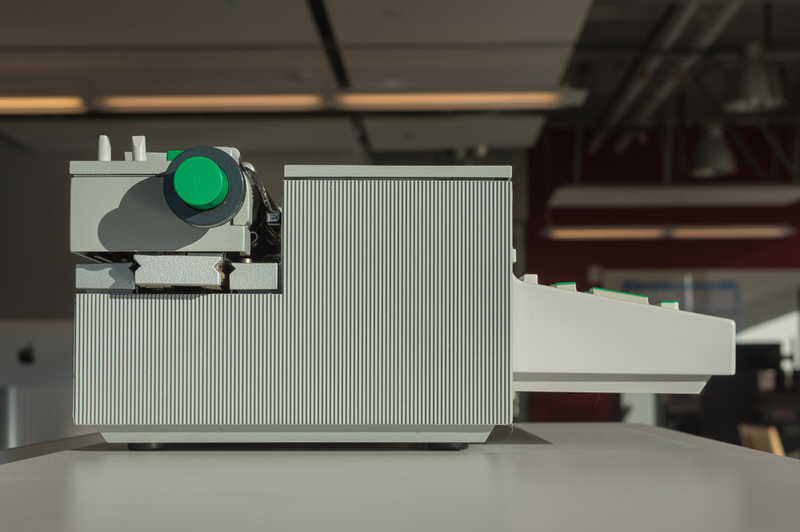 Due to its angular symmetry, when the platen moves to full-offset it cantilevers far off the side from the main mass, the same as the keyboard is cantilevered off the front. Now looking at the top of the machine, there is the flat metal slab covering the typing mechanism itself. The angled chrome pieces are almost like turret crenalations, and truth be told they are the one part of the design I don't like much. They just don't fit visually. But I do love how the heavy top plate rotates up and slides forward to reveal the mechanism fully. The Praxis 48 is one of Ettore Sottsass's less famous designs for Olivetti. Although not terribly remarkable from a modern perspective, this electric was fairly radical when it was introduced in 1964. One wonders if there isn't a bit of Frank Lloyd Wright inspiration in the cantilevered keyboard and abundant right angles. The ribbon cover comes forward and tilts down in what may be a deliberate echo of the Studio 42. Inside, the ribbon spools are mounted almost vertically. The Praxis 48 may not be one of Sottsass' or Olivetti's best known designs, but I feel that's a shame. It has a strong integrity to its form, yet through its clever detailing and textures succeeds at bringing a smile to your face during office work (without being as overt as the Valentine). There are so many little things to enjoy and study upon closer inspection - all things which didn't need to be there for technical or practical reasons, but which lift the Praxis 48 out of the realm of hum-drum typewriter competitors. The entire machine can be understood as a kind of inside joke: it aims to be a bit funny, joyous but also precious. It engenders a way of looking at mechanics as if you were looking at a toy rather than a real machine: it aims to be an object we are happy to look at, one we approach without fear and without thinking 'I must get to work': it was designed to sit on the tables of new photographers, new journalists, new designers, etc. The Praxis 48 is a perfect example of how designers, at their best, can channel their philosophy and personality through the arduous development and mass-manufacturing process. It is then up to us as customers and users to pay attention to what they have done, and recognize the connection across time and space they are seeking to make.